FORT COLLINS, Colo., July 10, 2018 /PRNewswire/ -- Whether headed to the lake, forest or beach, OtterBox has built a reputation as a staple on every outdoor excursion. 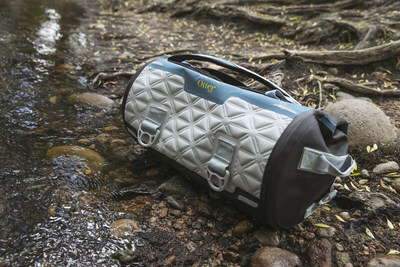 OtterBox introduces Yampa Dry Duffle, the waterproof bag that keeps gear safe from water, drop, sand and dirt, coming soon. The latest in the outdoor gear line from OtterBox, Yampa Dry Duffle is available in three sizes – 35-liter, 70-liter and 105-liter – and redefines the dry bag with enhancements that make gear-toting easier from start to finish. "OtterBox was founded with a drybox in 1998 and we have continued to evolve our products to enable adventure," said OtterBox CEO Jim Parke. "The original drybox was developed to keep valuables safe and dry during outdoor activities and the Yampa line is a great continuation of that heritage." 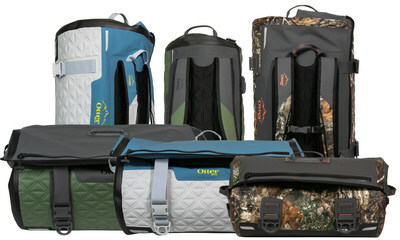 Yampa 35 ($249.99-$299.99); 70 ($299.99-$349.99) and 105 ($349.99-$399.99) come in Ridgeline (green/black with bright orange interior), Hudson (blue/white with a bright green interior) and Back Trail (Realtree Edge camo with bright orange interior). OtterBox is also expanding its cooler offerings with attractive new designs by artist Derek DeYoung on Venture coolers and 3250 Series dryboxes. Plus, new Trooper cooler accessories include a Collapsible Food Container, External Pouch and a Universal Cup Holder. All products are covered by the OtterBox Limited Lifetime Warranty. OtterBox is showcasing a full lineup of outdoor gear at ICAST in Orlando, July 11-13 at booth 2100, and at Outdoor Retailer, July 23-26, at booth 39061-UL, including Yampa Dry Duffle; Venture Coolers and accessories; Elevation Tumblers in new colors; a variety of new Elevation lids; Trooper Coolers and new accessories; and 3250 Series Drybox. For more information on OtterBox outdoor products, visit otterbox.com.